SLAMDANCE Film Festival will showcase 8 feature length films by Women Filmmakers in their 2017 line-up. As part of our ongoing coverage and support of #WomenInfilm throughout the world of Independent film, we are excited to continue our journalistic directives in helping promote the works of these emerging filmmakers. Originating in 1995, the SLAMDANCE film festival has emerged as one of the top film festivals in the world whose screenings have showcased and help discover talented filmmakers such as Christopher Nolan (The Dark Knight Trilogy) and Oren Peli (Paranormal Activity), Jared Hess (Napoleon Dynamite) and our own Pacific Northwest Native writer/director Lynn Shelton (Humpday) to mention a few. The festival has grown exponentially in the 21st century to now include multiple layers of creative opportunities for filmmakers and creatives. Their programs include the center piece Film Festival that takes place each January in Park City at their original headquarters The Treasure Mountain Inn and screenplay competitions and while forging global partnerships with the likes of Microsoft (Slamdance Studios / Xbox + Zune) and others to expand the scope of audiences for their filmmakers and alumni by embracing the latest in digital viewing platforms technology. Struggling musician Jesse tracks down his ex Anne in a small town in New Mexico, and is forced to face the decisions of his past as present day consequences set in. Naomi seems like a typical 11-year-old Orthodox Jewish girl; watching her compete to lift almost three times her bodyweight tells a different story. Adult victims of physical abuse by clergy members in Austria revisit the sites of their childhood trauma and make public their stories to shed light into one of the greatest crimes of the post-war period. Betty is a lonely strip mall security guard, and an unexpected moment with charming deadbeat Danny ends up setting off the unraveling of both their lives. Director(s): Frauke Havemann; Co-Director: Eric Schefter; Screenwriter: Mark Johnson Set in an unspecific time of extreme climate change, an isolated group of disoriented characters develop their own strange belief systems and engage in absurd activities to process their dilemma. Established in 1995, Slamdance is dedicated to discovering and supporting new talents in independent filmmaking. Notable Slamdance alumni who first gained notice at the festival include: Christopher Nolan (Interstellar), Oren Peli (Paranormal Activity), Marc Forster (World War Z), Jared Hess (Napoleon Dynamite), Lena Dunham (Girls), Benh Zeitlin (Beasts of the Southern Wild), Anthony & Joe Russo (Captain America: The Winter Soldier), Jeremy Saulnier (Blue Ruin), Seth Gordon (Horrible Bosses), Lynn Shelton (Humpday) and Matt Johnson (Operation Avalanche). Box Office Mojo reports alumni who first showed their work at Slamdance have earned over $11.5 billion at the Box Office to date. Slamdance Presents is a new distribution arm established to access broader distribution of independent films. The goal is to build the popularity of independent films and support filmmakers on a commercial level through theatrical releases. In August 2016, Slamdance Presents launched the week long release of Claire Carré’s feature sci-fi film, Embers, at ArcLight Cinemas Hollywood. Steve Yu’s The Resurrection of Jake The Snake was the first film to be released by the company. The documentary reached number one on iTunes in December, 2015. In November 2015, Slamdance announced DIG (Digital, Interactive & Gaming), a new digital, interactive and gaming showcase dedicated to emerging independent artists working in hybrid, immersive and developing forms of digital media art. Ten works were featured in the inaugural DIG show that opened in Los Angeles at Big Pictures Los Angeles on December 4, running through December 13, 2015. The show was also featured at the 2016 Slamdance Film Festival. Previous Slamdance alumni include: Bong Joon Ho (SNOWPIERCER), Lena Dunham (TINY FURNITURE), and Christopher Nolan (THE DARK KNIGHT; MEMENTO). The 23rd edition of Slamdance will also feature DIG (Digital, Interactive & Gaming) which showcases eight works by emerging artists working in cutting edge digital media, and Polytechnic, a series of free, open-learning workshops that explore new ideas and disrupt existing ones with unique perspectives on filmmaking and new media production from industry insiders. 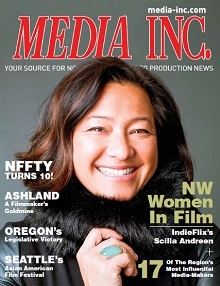 Follow @MEDIAINCMAG for @Slamdance #WomenInFilm coverage this year on Twitter.